Whether it’s a brand new kitchen or part of a renovation, the kitchen is easily one of the two most exciting rooms to design (the bathroom is the other). What is likely the question at the forefront of every homeowner’s mind before digging into this endeavour, is how much a new kitchen is going to cost. So how much does the average kitchen cost in Australia? 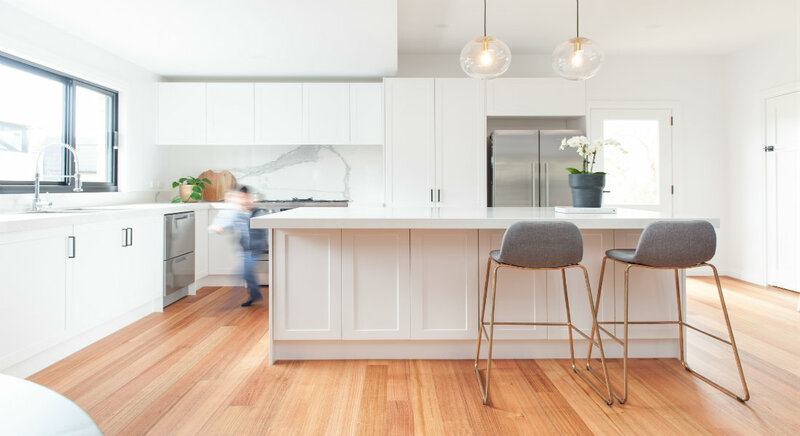 Houzz found that in 2017/18 Australians spent an average of between $12,000 and $20,000 for a kitchen renovation. Choosing higher quality materials means paying more for your kitchen up front. But don’t let that deter you from choosing more durable and attractive materials for your kitchen. Investing in quality materials from the start is a good investment in the long run. They’re more likely to last longer, and chances are they’ll maintain their beauty for substantially longer than their less expensive counterparts. There is a caveat here, however. Many assume that bespoke cabinetry which can easily cost more than $20,000 for a medium-sized kitchen is the only way to have “quality” cabinets. But the cabinets offered here at Zesta Kitchens, can fit any space and gives a professional finish while easily coming with a price tag that is a fraction of what to expect. Don’t believe us? Stop by one of our three showrooms and one of our accomplished kitchen designers will show you your options in person! The more difficult the job, the more you can expect to spend. This is why it’s a good idea to keep your kitchen layout similar to its original form so that gas, water, and electrical outlets won’t need to be relocated. Hire unlicensed tradespeople, and you’re sure to save money in the short term. But are you willing to sacrifice guaranteed quality – and possibly put your home insurance at risk – to keep some extra cash in your wallet? Always use licenced trades. The larger the kitchen, the more materials you’ll need to fill the space and the longer the completion timeline will be. If the price is a concern, consider scaling down on the size of your kitchen and looking into ways to make this space more efficient for you and your family. Unless you’re qualified you will likely need to hire a plumber and an electrician. Other tradespeople you may consider hiring are tilers, painters, ventilation experts, flooring installers, and window installers. Calculate your kitchen costs with Zesta Kitchens. Find out how much you can save on your kitchen by choosing a Zesta Kitchen. We invite you to visit us at any one of our three locations or use our kitchen calculator. Simply select key details such as the style of kitchen, shape, size, and benchtop, and we’ll provide you with an immediate estimated total.